[Platform] just closed on a building near the Convention Center, an 11,000-square-foot structure at 408 N. Sixth Street, which was the former site of the Carfagna production facility. 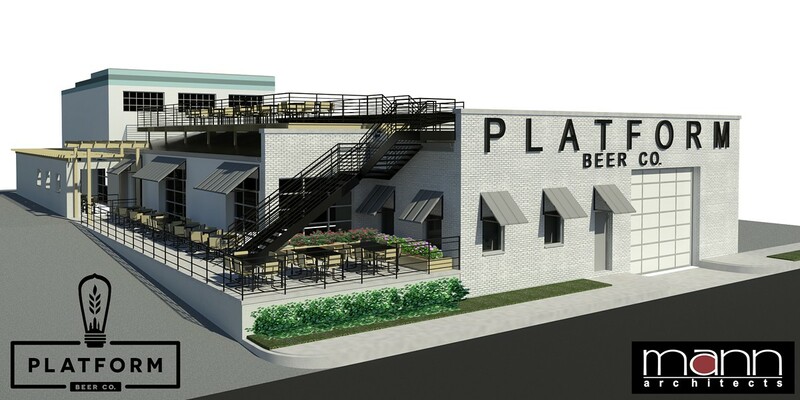 That property will have a small brewery and taproom, while also serving as the storage and distribution center for its Cleveland-brewed beer. Awesome addition to the craft brew scene here in Columbus, but the location is kind of in no man’s land. Off a one way street and limited parking. Looks like it is more of a warehouse for them with only 150 seat tap room, which seems small but I may be wrong. That rendering looks great, but it is a really odd location. Not for the brewery per se, but for a taproom. That’s taking ‘destination spot’ to a whole new level. It’s not geographically that far out, just very isolated. I think “near the convention center” may tell one of two thoughts. 2. The writer of the article did a Google search and thought the convention center would be the most identifiable landmark for Cleveland readers. I would not associate this with the convention center, but that’s me. Wow, yea that is an awesome view. The building and views look to be awesome, but the location is very isolated. I saw in the Biz First article that they partially chose the building since it already had things they needed for a brewhouse like floor drains and walk in coolers since it used to be a meat processing plant. The location is a little strange. But seems very convenient for Columbus State and Abbott. Amazing how few options those two places have given the # of professionals who work there. Timing is also good given the BalletMet expansion. I love the idea of downtown being better connected to Short North/Italian Village so it’s good to hear this area is getting some residential/retail attention. Given the success of Elevator Tap Room and Wolf’s Ridge, despite not being in necessarily dense locations, I like it. What’s up with the gate on Buckingham St. (looking at Google Street View)? Is that still there? Also, is that lot across the street owned by Abbott? I’ve never really seen this little nook of downtown before, and that seems like a lot of undeveloped land that’s just storing some empty semis. Kind of a funny glitch. I believe if you search for 328 Buckingham St a building magically shows up, so I’m guessing it’s built but Google Maps doesn’t show it at every angle. Soon beer will be coming out of our taps in Columbus. While I enjoy some of their beers, I can’t help think that decisions like this are what will lead to the inevitable burst of the craft beer bubble. I live 20 minutes west of their location in Cleveland and they don’t even distribute their beer in my county (Lorain). They are nearly nonexistent in the Akron/Canton area. Their idea of self distribution is archaic and they continue to grow way too quickly especially when I find it hard that the demand is there for their product. I mean, why? Will there be a similar bursting of the restaurant bubble? The quality coffee bubble? The good bread bubble? The farmers market bubble? Since some of the craft beer segment’s growth is driven by the same forces that are driving growth in local food (farmers markets have been the fastest growing segment of the food industry for years now), is that your angle? That people will tire of buying food/drink from local providers and, once that local bubble inevitably bursts, it’ll be back to the glories of Wonder Bread, Spam and Folgers? I can see, someday, the market reaching saturation, and the growth in the craft beer segment tailing off. Breweries that make poor products or bad business decisions will fail; like they do in all industries. But that won’t look like a bursting bubble, just a leveling off of what’s been amazing annual growth for 15-20 years running. Unless you think that beer drinkers will suddenly stop wanting to drink craft beer and will go back to Budweiser…is that it? Craft beer is not Bartles & Jaymes. It’s not a fad. While American brewers, especially, like to play around with beer styles, the craft beer segment plays homage to the historical diversity of beer styles from around the world, styles that have been around for centuries. It’s the macro segment that’s artificially dumbed-down beer to mean fizzy yellow pisswater. I have no idea if Platform will do well in Columbus. And I’ve already expressed my concern that BrewDog’s local venture seems anything but a sure bet to me. But not because of any looming bursting of the craft beer bubble. In the past year, the US reached its historical high in the number of breweries. The previous high was set in 1873. There are 4000-ish breweries in the States now. I see no reason why that number can’t continue to grow. There may be some shocking failures, as certain breweries overextend themselves. But the number of thriving local breweries shows no sign of tailing off anytime soon. I agree – we are some distance from the craft beer bubble bursting. If we see a lot of breweries come in the size of what North High, CBC, and Four String are aiming for then there may be a speed bump but with most breweries following a small neighborhood model like Lineage, Pigskin and etc. – we should be good for some time. My count has 40 craft breweries in Central Ohio by the end of this year. Portland, which is smaller than Columbus supports about 60 and continues to grow. Platform is a good addition to the community.